Unfortunately, similar developments loom ahead in Southeast Asia - a region that is far more important economically and strategically. 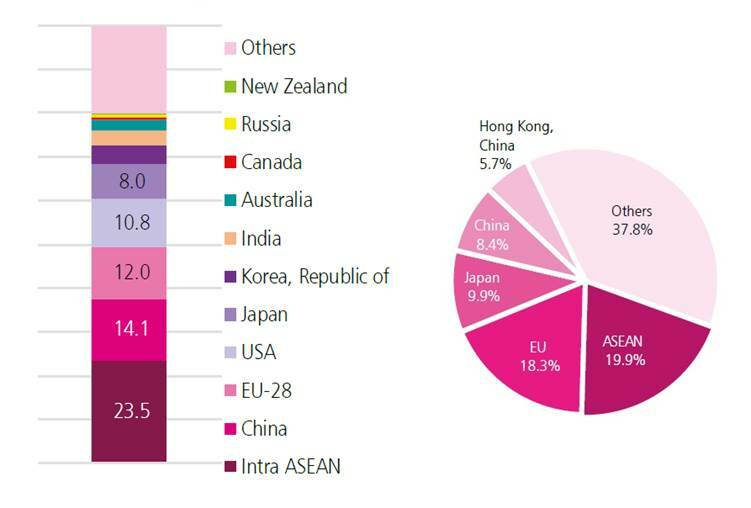 Indeed, China trades with ASEAN (20%) almost as much as ASEAN economies trade with each other (22%). It is the same story with foreign direct investment (FDI). In 2017, China and Hong Kong accounted for some 15% of all FDI to ASEAN. US figure has plunged to less than 5% (Figure). Moreover, US trade with ASEAN is now subject to the ‘America First’ stance. As the Trump administration puts it, “we need ASEAN to do more for us.” The White House seeks “rebalancing” in ASEAN trade ties. It wants to negotiate deals bilaterally with each ASEAN economy - to maximize its leverage. The US has a combined trade deficit of $92 billion with ASEAN countries; that is higher than its deficit with Mexico ($71bn), Japan ($69bn) or Germany ($65bn) - all of which have already been hit by the Trump administration's new protectionism. U.S. overall stance toward the ASEAN is changing. Ever since Obama's security pivot to Asia, Pentagon has been aiming to move 60% it's warships into the region. The White House has revised its stance accordingly. In the new 2017 National Security Strategy, China is portrayed as America’s “adversary” rather than a partner. An enemy - real or perceived - is vital for arms sales. Pentagon already dominates sales to Australia, Japan, South Korea and Taiwan. Among the greatest arms importers in Southeast Asia, Indonesia buys a third of its military imports from the UK and US; Singapore more than two thirds from the US. Pentagon wants more deals with Vietnam (which favors Russia), Thailand (which relies on Ukraine and China), and Myanmar (which prefers China and Russia). Outside ASEAN, US wants to sell more to India (which relies mainly on Russia). That's why, like US Africa strategy; American ASEAN strategy is likely to seek to militarize Asia Pacific, which has potential to divide the region. In both regions, the White House seeks to drive rearmament, mainly at the expense of economic development that China promotes. And in both regions, the White House shuns peace-keeping activities in which China is the world's leading actor today.